A funny thing happened when Oleg walked into IKEA and asked if they could help him design a kitchen for his new home. IKEA said no, we can’t help you design a kitchen for that space. Not only did IKEA say no, but the other kitchen cabinet vendors he talked to also said no. 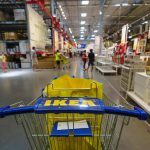 Why did IKEA and other vendors say Oleg’s kitchen was too difficult? Couldn’t they see how badly Oleg’s home needed a new kitchen? But then Oleg found us. And we said YES to that dress. This photo is from the same angle, but closer to the kitchen. Why would IKEA refuse to design for this kitchen? The kitchen had a wall with a 144° angle. It’s the one to the right of the exhaust hood. While that’s a difficult angle to work with in a kitchen design, it certainly wasn’t impossible. We accomplished this by using two really big cover panels to hide the dead space between the oven range and the drawers next to it. That’s all it took to handle the difficult angle in Oleg’s kitchen. You can see the fillers better in this shot. It really wasn’t so difficult! The key to designing an IKEA kitchen with a difficult angle is to resist the urge to fill every inch. When you have an obtuse angle, allowing for some dead or empty space is just the ticket. The red arrow points to the 144° angle. On either side of the dead space, there are 2 big cover panels covering the gaps so everything looks smooth and neat. Unless you know they’re there, you wouldn’t even notice, would you? This is exactly what IKEA cover panels are for: covering the exposed sides of refrigerators and cabinets, hiding dead spaces, and providing under countertop support for appliances that are part of a cabinet run. And, making base cabinets work even with a difficult angle. By now you’ve probably noticed how much storage we helped Oleg fit into the kitchen. Oleg and his wife really wanted to fit 90” high cabinets on either end of their 95” of height in the kitchen. This is a no-no…in most cases. Add in the legs and toekicks and you run the risk of not being able to fit the cabinet in. Like one of our installers reminds us, no home is perfect, and walls are always out-of-plumb. But at IKD, we pride ourselves on our ability to collaborate with our customers. Oleg was willing to cut down the legs and the toekicks so we included the 90” cabinets in his design. Look how nice they turned out! Here are the high cabinets on the other side of the kitchen. Oleg told me he originally wanted a much larger kitchen island, but he’s glad he let Ana talk him out of it for 2 reasons. The piece of countertop they bought to cover the island barely fit through the door. A larger one would not have fit through the door at all. The amount of walkway around the island is perfect for the chef. Oleg’s family can comfortably sit around the island even when he or his wife are cooking. The island is also a small miracle of storage. There isn’t a dead cabinet anywhere in there. You can’t see it in the photos, but the cabinets across from the range are also functional. The side facing out from the kitchen is just the back of those cabinets, covered by a panel. As you can see in the last picture, Oleg is not the only family member who’s pleased with the results. Does your kitchen have a difficult angle, columns, or other obstructions? IKD can design for it, no problem! Unlike IKEA, our kitchen design professionals have never met a kitchen they couldn’t design for. 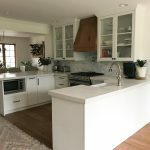 We highly recommend our Premium Package for customers with kitchens with a difficult angle, columns, narrow spaces, or other obstructions that could interfere with the design. Let’s get started on an IKEA kitchen design for you.